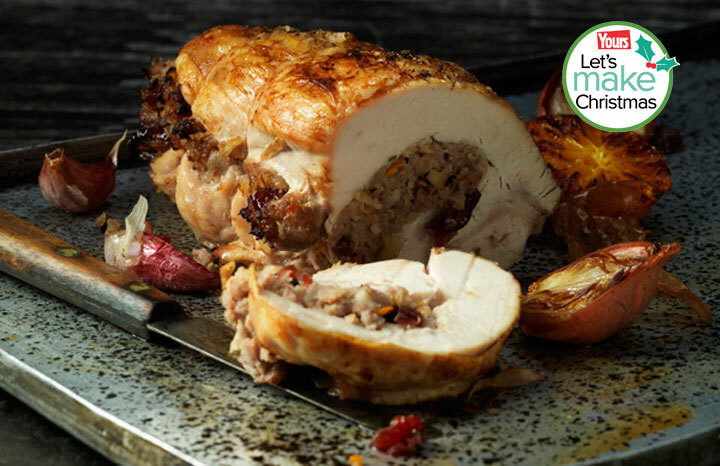 Prepare the turkey breast by slicing it lengthways across the middle to create a pocket for the stuffing, be careful not to go right the way through. Place turkey on a plate and set aside for later. To prepare the stuffing, add the shallots, garlic and rosemary, to a saucepan and sauté until softened (approx. 5 minutes). Set aside and allow to cool in the saucepan. Add the cranberries, sausage meat, chopped walnuts, orange zest, breadcrumbs and nutmeg to the sautéed ingredients and season well. Open up the pocket made in the turkey breast and fill with the prepared stuffing. Use butchers string to secure the stuffing within the turkey breast. Tie in approximately four places to ensure the filling doesn’t spill out during cooking. Roast for 45 minutes basting with the cooking mist half way through cooking for a perfectly crisp, golden finish. Cover the turkey with foil and allow to stand for 10 minutes before slicing to serve. Recipe from James Ramsden for Lurpak® Cooking Mist.